Have you ever had an almond croissant? Called Amandine in French, this bakery staple is a clever way to delightfully recycle yesterday’s croissants. The croissants are sliced in half, doused with syrup, filled with almond cream, then baked again until the filling sets and the tops get crunchy. This indulgent treat is elegant, flavorful, and…easy to make at home. I’d been wanting to make some for a long time, and when I stumbled on a pistachio version in Betty Hung’s new cookbook, French Pastry 101, I just knew I had to make it. You see, pistachio is my favorite nut: it has a unique, exotic taste, and its color makes any dish look outstanding. 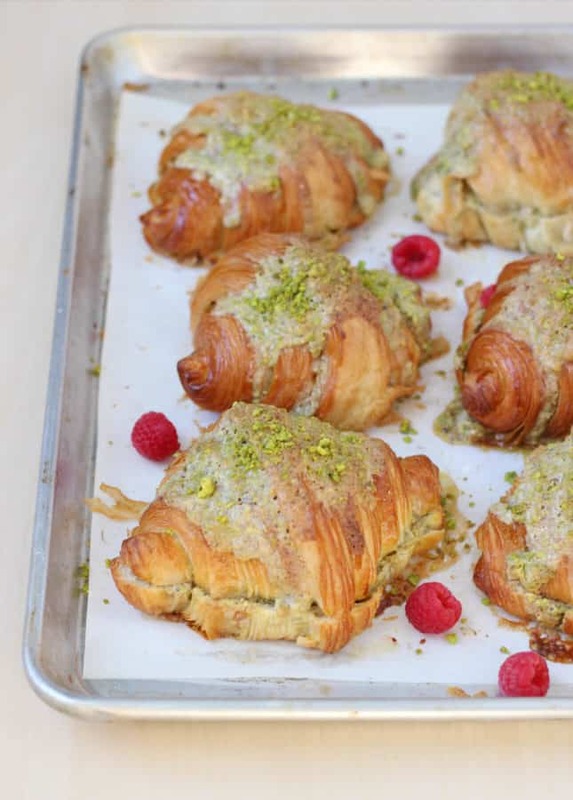 I knew I could trust this amazing-looking pistachio croissant recipe since Hung is a pastry chef and the owner of Vancouver’s renowned Beaucoup Bakery, where I dream of going someday. This impressive breakfast treat is way easier to make than it looks, especially when you prepare the components ahead of time. You can refrigerate both the syrup and the pistachio frangipane for up to three days, so if you keep a bag of croissants on hand, this makes you just a few minutes away from enjoying freshly baked pistachio croissants every morning. Dangerous, maybe, but oh so delicious! I’ve made these pistachio croissants several times already using croissants from my favorite local bakery. If you want to go the extra mile, you could also make your own homemade croissants and turn the leftovers (if any!) into these gems. 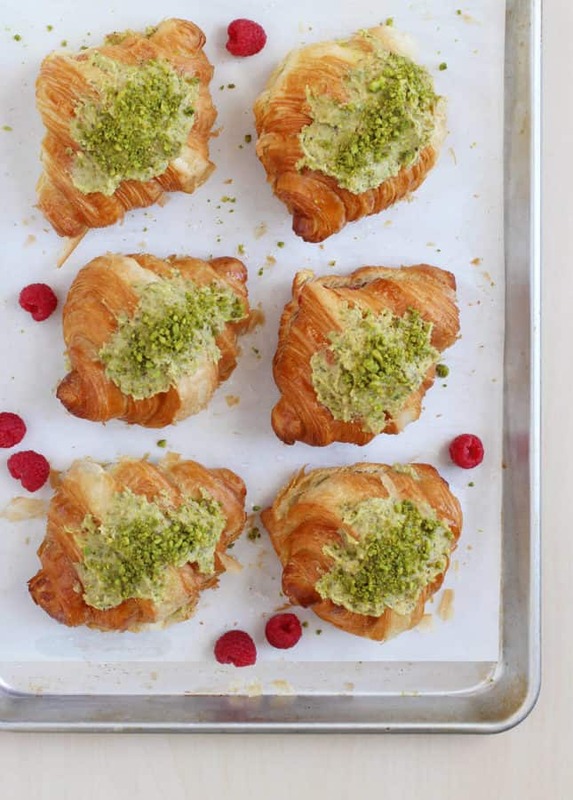 These pistachio croissants may very well be one of the most delightful treats to wake up to, but they also make for a really fine dessert for brunch—or any time of day, really! Use peeled pistachio nuts for the brightest green: Nuts are expensive, which is why I buy them from a bulk company that sells them by the kilo and store them in the refrigerator to keep them fresh. I always order from Yupik, which sells through Amazon.ca, because their nuts are top quality and always fresh. I recently noticed they sold peeled pistachios for just a couple dollars more than the regular, shelled nuts, and they’re so worth it: you pay only for the nuts—not the peels—and you get a truly eye-popping shade of green. Refrigerate the pistachio frangipane before using: You can use the frangipane right after making it, but it’s a bit runny, which means the frangipane you spread over the tops will run down the sides a bit upon baking. There’s nothing wrong with that, but if you’re a perfectionist like I am, I recommend refrigerating the frangipane for 20 to 30 minutes to stiffen it a bit. That way the topping holds still while baking so the pistachio croissants look their very best when they come out of the oven. Make-ahead tips: You can refrigerate both the syrup and the pistachio frangipane for up to five days. 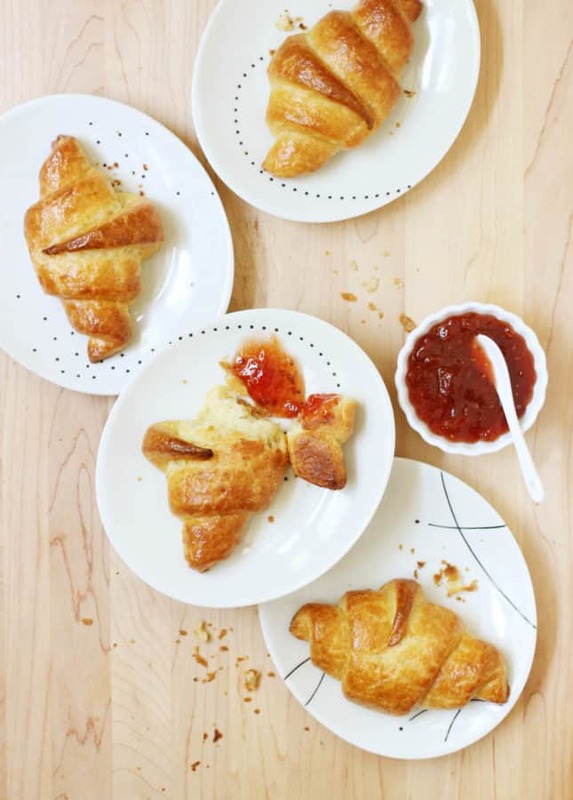 Make sure to stock up on croissants, then assemble and bake them the morning you want to serve them. 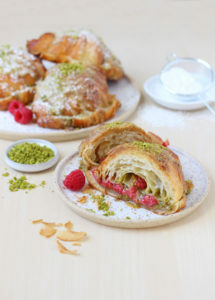 The baked pistachio croissants keep surprisingly well too! Store the fully cooled pistachio croissants in an airtight container, then reheat at 325°F (160°C) for six to eight minutes. Let cool on a rack for five minutes, and enjoy! 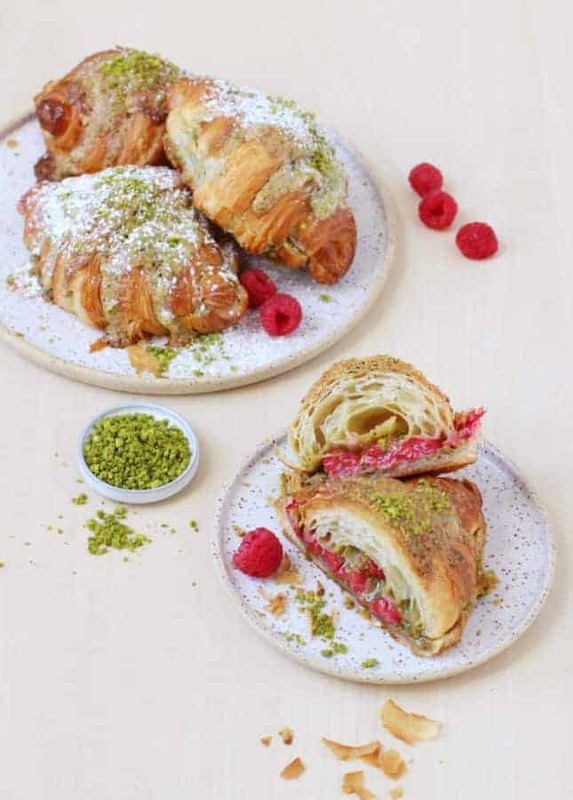 Garnish with fresh berries for an additional pop of color: In French Pastry 101, Betty Hung garnishes her pistachio croissants with sour cherries. I’ve made them with raspberries! The tartness of the berries marries with the sweet nuttiness of the pistachios. Just know that fruit-filled pistachio croissants won’t store well because the humidity from the fruits will turn the croissants soggy. This isn’t an issue if you plan on eating them all the day they’re made, though! If you love French pastries but feel intimidated by attempting them at home, I urge you to get a copy of Betty Hung’s cookbook, French Pastry 101. 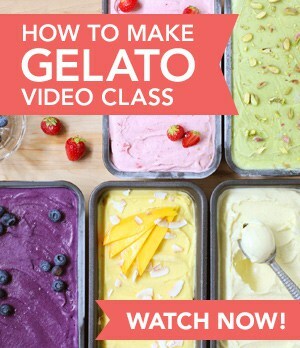 The subtitle says it all: “Learn the art of classic baking with 60 beginner-friendly recipes.” Betty’s recipes are straightforward, and they feature lots of process pictures, which are so useful when you’re trying to fully grasp the techniques she teaches. I really appreciate how she presents her methods in plain English, demystifying the making of desserts that often have a fussier reputation than they deserve. What sets her book apart, in my opinion, is that she provides amazingly useful visual cues to help you understand traditional recipe instructions that can be opaque if you’re a novice in the kitchen. One favorite example is her description of “room temperature butter”: “soft yet pliable; if you pressed it down with your finger, it should leave a clean dent yet shouldn’t stick to your finger.” This is such a vivid, useful description! 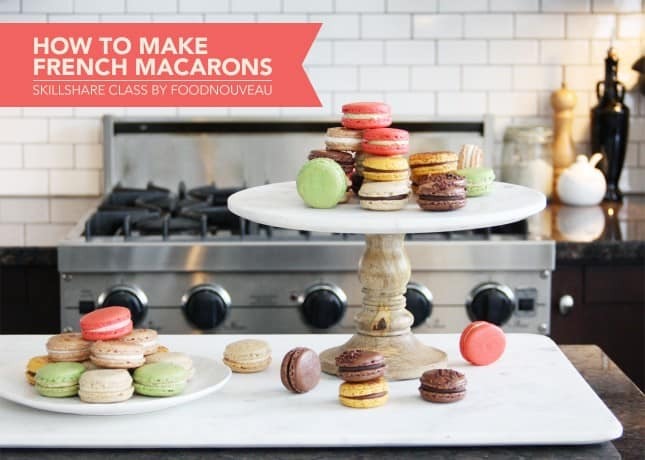 French Pastry 101 is filled with such tips and recipes for all the classic French desserts you probably assumed would never be doable at home, such as Gâteau Saint-Honoré, Paris-Brest, and homemade pâte feuilletée, which you can use to make mille-feuilles, chaussons, and palmiers. The book will give you confidence and turn you into a pastry pro in no time. It’s a must-have for all Francophiles! For more pastry inspiration, make sure to read Betty’s blog, Yummy Workshop, and follow her on Instagram, Facebook, and Twitter. These colorful pistachio croissants can be made in minutes using ready-made croissants from your favorite bakery. An indulgent treat to wake up to, and a delightful dessert, too! Line a baking sheet with parchment paper, then place the croissants on it until you’re ready to assemble them. For the syrup: Add the sugar and water to a small saucepan and place over medium heat. Bring to a boil, stirring until the sugar is fully dissolved. Remove from the heat and let cool to room temperature. The syrup can be made in advance and refrigerated in an airtight container for up to 3 days. For the pistachio frangipane: Place the powdered sugar and pistachios in a food processor and process until the pistachios are finely chopped. Add the cornstarch and salt and pulse to combine. Add the butter to a medium bowl and beat with a spatula until smooth. Add the pistachio mixture and mix until incorporated. Add the egg, vanilla, and Amaretto and mix until the frangipane is fluffy. Transfer the finished frangipane to a clean airtight container and refrigerate for 20 minutes, or up to 3 days. 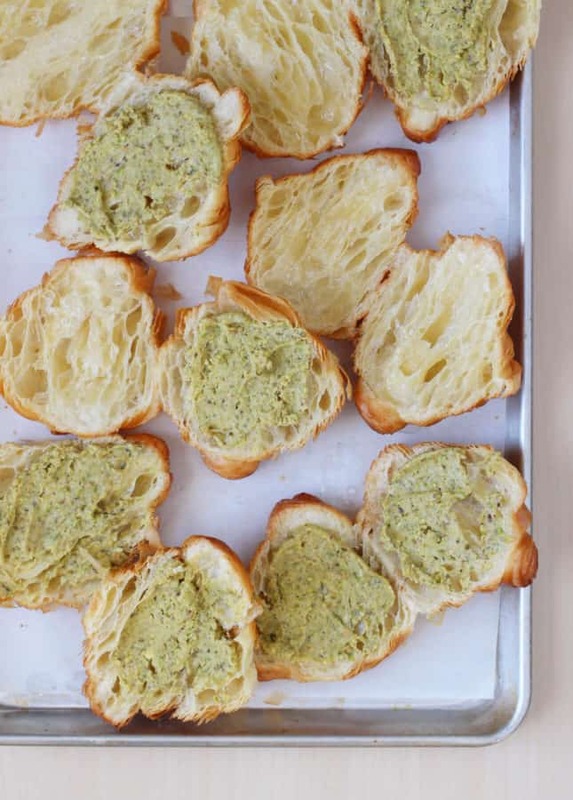 To assemble the pistachio croissants: Brush the syrup onto both cut-sides of the croissants until the surface is saturated. Spread about 2 tbsp (30 ml) of pistachio frangipane over each croissant half. If using, divide the berries between the bottom halves, then cover them with the top halves. Spoon, then spread about 1 tbsp (15 ml) of pistachio frangipane over the croissant tops, then press some crushed pistachios on top. Bake the croissants for 15 to 20 minutes, or until the frangipane on top of the croissant is barely turning blond. Transfer the baking sheet to a wire rack and let cool for 10 minutes. Dust with powdered sugar and serve. 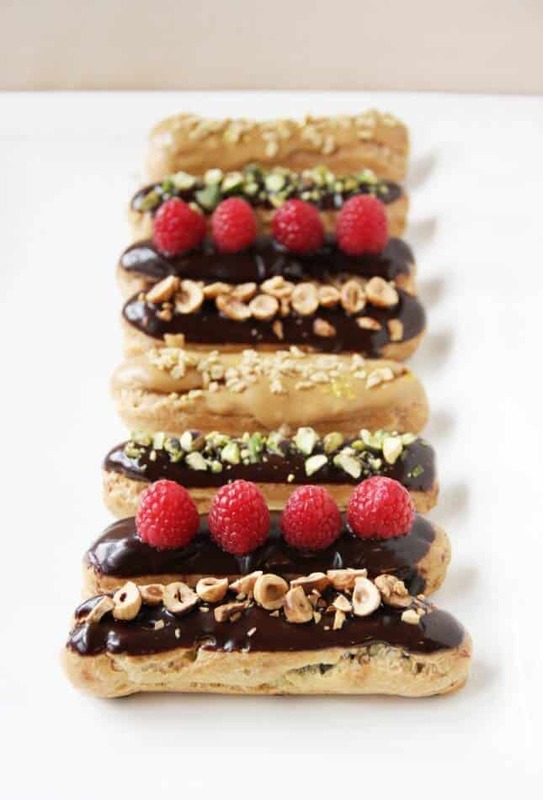 Recipe Credit: Adapted from French Pastry 101 by Betty Hung. Shared with permission.